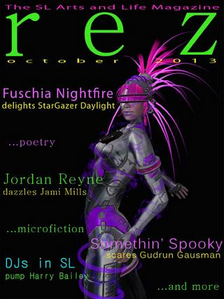 StarGazer Daylight interviews Fuschia Nightfire about the nature of our senses in Fuschia Is The Color of Creativity. Jami Mills interviews the ever so talented singer/songwriter, Jordan Reyne, in her article Jordan Reyne, a Nontraditional Traditionalist. Crap Mariner plays with us in his Words With Friends, telling us about the dangers of driving while distracted. Gudrun Gausman educates us in Succubus about Lilith and what we love so much about the succubus and incubus next door. Harry Bailey interviews two of his fave DJs here in SL, Graylon Ash and Blujns Benoir in his piece, Blu and Gray, DJs in SL. Luna Branwen speaks about our own presence in her beautiful poem, In A Painting. Sedona Mills brings us a poetic reflection on the things that matter most in A Reflection.